Pape Symmachus (Italian: Simmaco; died 19 Julie 514) wis the heid o the Catholic Kirk frae 22 November 498 tae his daith in 514. His tenure wis merked bi a serious schism ower who wis legitimately electit pape bi the ceetizens o Roum. ↑ 1.0 1.1 Kirsch, Johann Peter (1913). 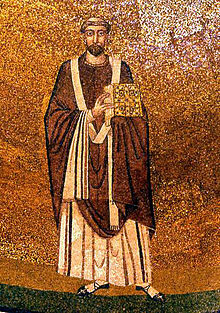 "Pope St. Symmachus". Catholic Encyclopedia. New York: Robert Appleton Company. This page wis last eeditit on 22 Februar 2018, at 00:13.